Notes and images pertaining to Maistre Lucien de Pontivy’s elevation to the Order of the Laurel at Fall Crown Tournament AS 48 (November 2, 2013). At Court on the tourney field that morning, Their Majesties called me before them and repeated the command they issued at their Coronation, a month previous: to spend the day in a vigil, considering of their question. They called forth their Order of the Laurel to take me to the vigil. I spent the day in relative seclusion, attended by the self-styled “crack vigil team”, with a stream of well-wishers and luminaries wishing me well and issuing me good advice. 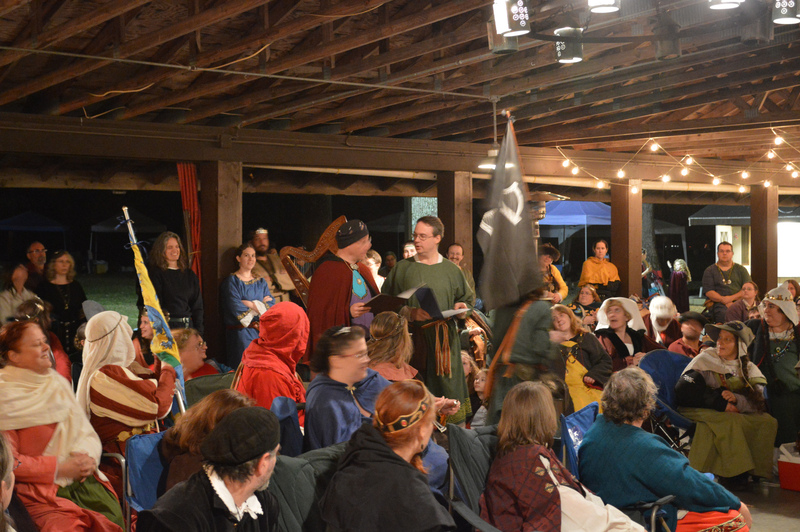 Late in the day, I joined my beloved Lady and friends to watch the close of the Tourney and await evening court. As the last piece of court business that evening, Their Majesties called Baron Jehan du Lac. 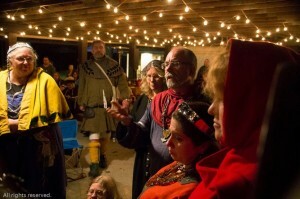 Jehan spoke with Their Majesties about his apprentice; in response they called me before them to answer their question. I came in to court escorted by my friends. “Lucien, my apprentice. I would have of you that which I gave you,” Jehan told me. I took off my green belt, the symbol of my apprenticeship, and gave it to my Patron. 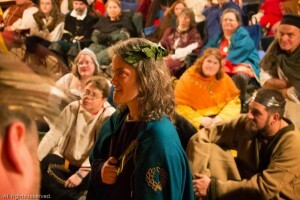 The Vox Regis called forth the Order of the Laurel. 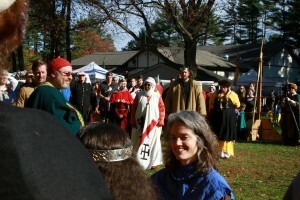 The ceremony proceeded according to the rite. Baron Steffan, who could not be present on the day, sent words for the Order of the Pelican. Baroness Nataliia read them on his behalf — and added her own. 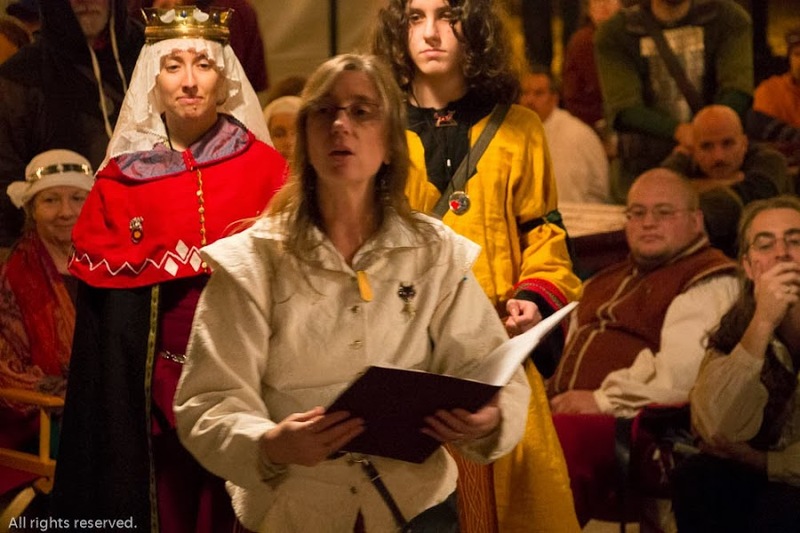 Sir Michael spoke for the Order of the Chivalry; then Countess Thyra for the Order of the Rose. Mistress Catrin spoke for the Order of the Laurel. When she was finished, His Majesty asked for formal regalia: a mantle, medallion, and wreath. When all of the acoutrements were fastned on me, Dreda sang my scroll text, which she had and Jehan had translated into Early French. 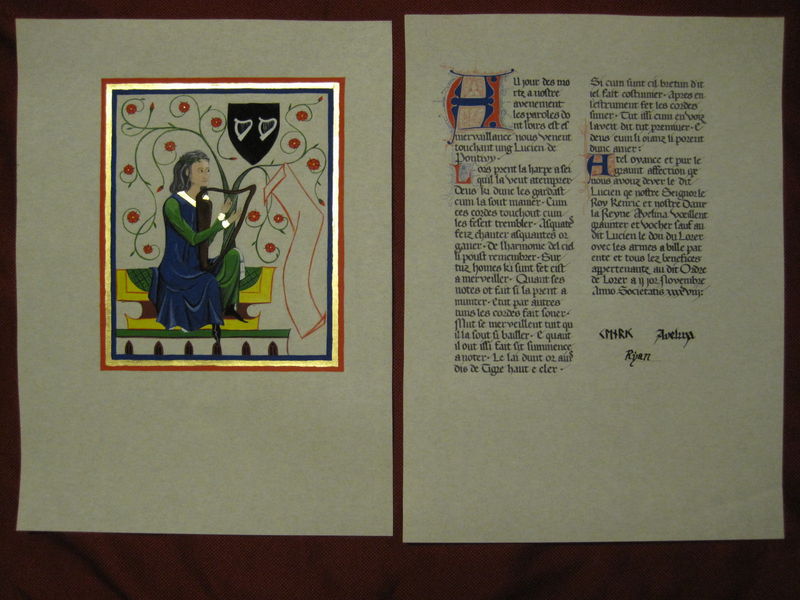 The scroll had been illuminated and calligraphed by Mistress Eva, who based it on one of my favorite images in the Manesse Codex. Martyn read the English translation. Click here for scroll details and source material. 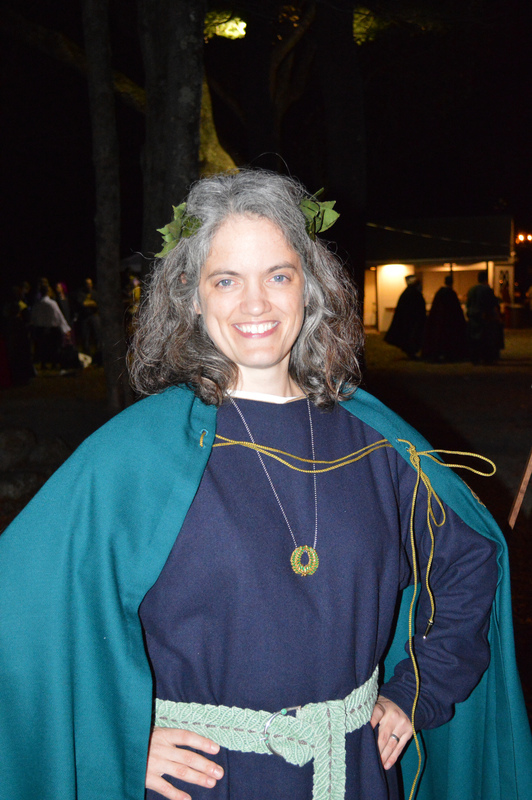 Finally, Jehan gave me an artifact with a heavy legacy: a pale green belt handwoven in the shape of laurel leaves, with a silver buckle. It was made by Cariadoc of the Bow for Marian, the second Laurel in the East Kingdom, who gave it to Jehan. “Je m’appele Lucien de Pontivy. En la langue Bretonne, je suis nommé Lukian Pontivyen. Je jure a partir de cette heure et dorenavant que je serai ton homme, pour la musique, pour le conseil honnête, et pour l’honneur. Il en sera ainsi. Some of my friends were kind enough to share their records of the day. Miss Molly Eskridge and I had a most amazing Saturday. 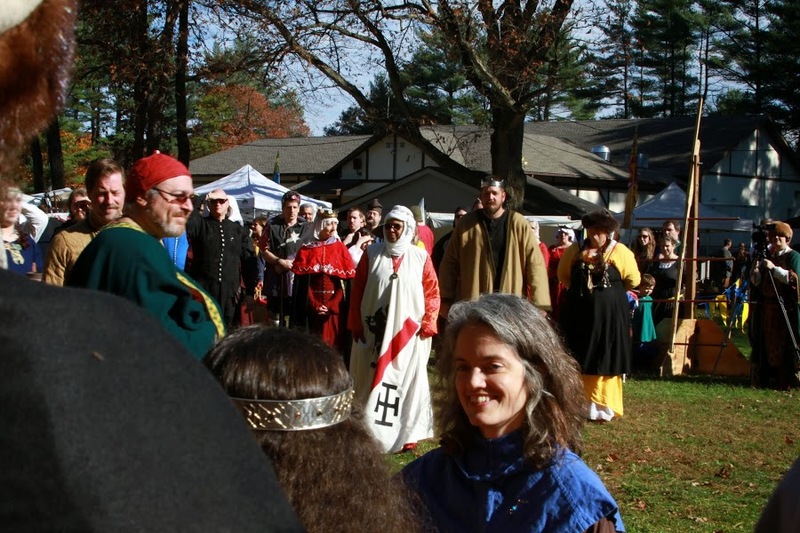 At the East Kingdom Winter Crown Tourney we had amazing weather for a thrilling combat tournament. I spent the day in a Vigil, surrounded by my best friends in the SCA, who brought me lots of good advice, beautiful music, and my favorite foods. Then in court that evening I was elevated to the Order of the Laurel, the highest award of arts achievement in the SCA. I received lots of kind, eloquent compliments and beautiful, weighty awards, but the best gift of all is my friends. 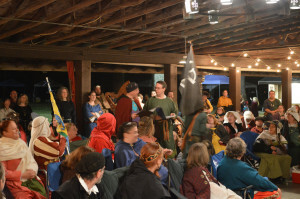 There were many achievements on Saturday: a Knighting, heroic feats in the Tournament, and a Coronation; besides that, well-deserving friends were recognized and made a fuss over. I’m thrilled to have been called up for honors on the same day as these folks. My vision was a bit constrained for the day. 🙂 And a lot of people made me feel awfully special. Before too much time goes by, I want to direct attention to them. Eleanor and Nataliia organized the vigil. Many, many people brought my favorite foods and drinks, and many many more came to see me and offer companionship and good advice and gifts. Aife, Aneleda, Camille, and Emma played harp and sang in my vigil tent, filling me with bliss all the day long. As we entered court, Eric carried my banner, which Antonio and Elizabeth made. 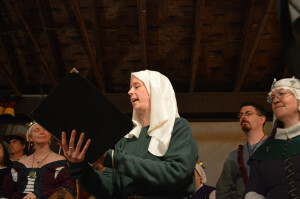 Peregrine and Tibor sang the processional: a 13th C. duet Dreda adapted. Chris carried my harp. Michael spoke for me, for the Chivalry. Steffan (by kind proxy of Nataliia) spoke for me, for the Pelicans. Thyra spoke for me, for the Ladies of the Rose. Catrin spoke for me, for the Laurels. Jehan sewed my cloak; Nicolette embroidered the laurel appliqué and Edith braided the cord. Edith also braided the cord for my medallion. The medallion was a gift from Jehan. He had it of his sworn companion Luke, who made it, at his own elevation to the laurellate. 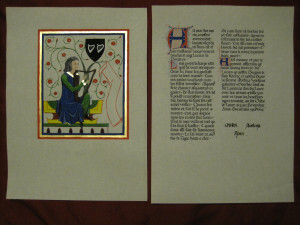 Dreda sang my scroll text, which she wrote and Jehan made Early French. Eva illuminated and calligraphed it, basing it on one of my favorite images in the Manesse Codex. Martyn read the English translation. Finally, Jehan gave me a belt with a heavy legacy: a pale green belt handwoven in the shape of laurel leaves, with a silver buckle, made by Cariadoc for Marian, the second Laurel in the East Kingdom, who gave it to Jehan. All and all were provisioned and guided by my beloved Dreda, for a long time behind the Veil of Surprise and Delight.